I think I'm addicted to gardening. It's all I think about. All I do right now. Am I just getting my fix after our gardening drought of the past three years, or do I have an actual problem? Little bit of column A, little bit of column B? Today was an excellent gardening day and I'll tell you why. Yup. You read that right. Chicken poop. My lovely friend Erin posted on Facebook asking if anyone wanted chicken poop and another friend, who must have seen my last Craving Fresh post, pointed it out to me. I put my hand up for that chicken poop so fast, I broke the sound barrier. Baby J and I drove around to Erin's house this morning to scoop the poop. Erin and I filled a large bucket, which I brought home in the car. Thankfully the bucket had a lid, so the poop didn't stink our car out at all. 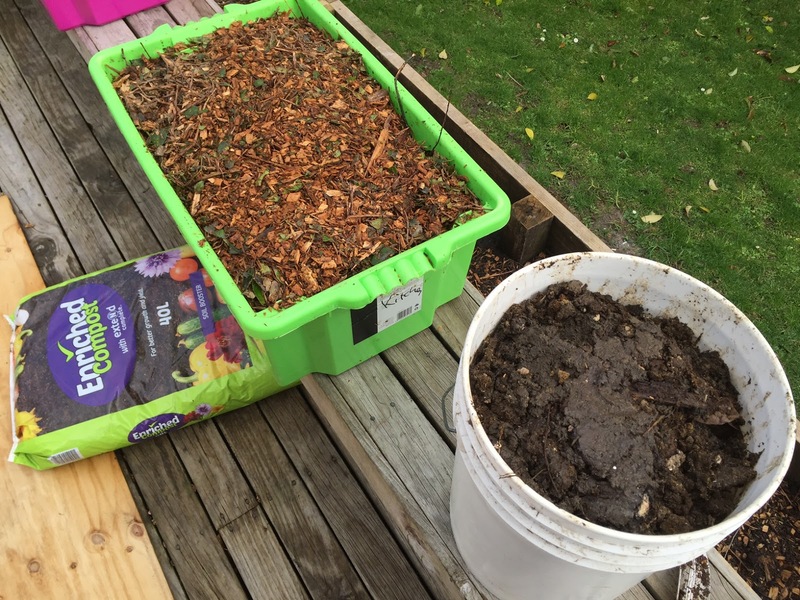 Chicken poop and more wood mulch for the garden. I spread most of the chicken poop along my citrus bed, and then topped that off with another layer of wood mulch that J and I had also picked up on our way back from Erin's house. The citrus bed is getting nicely full now and is ready for the top layer of compost so I can plant it with a lemon, a lime and two mandarin trees. I'm going to plant all dwarf varieties so they don't shade out the vegetable gardens behind too much. The citrus bed got fertilised with chicken poop today. 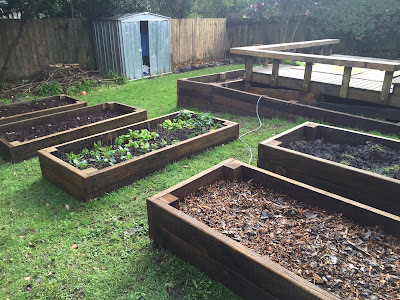 Over the weekend I managed to get my fifth garden bed dug in. It had been sitting off to the side because a post next to the trellis was in the way and not letting the bed lie flat. I sawed the post in half and pulled the half that was under the bed out. Finally this bed is in the ground. I'm planning to grow tomatoes up the trellis behind it. 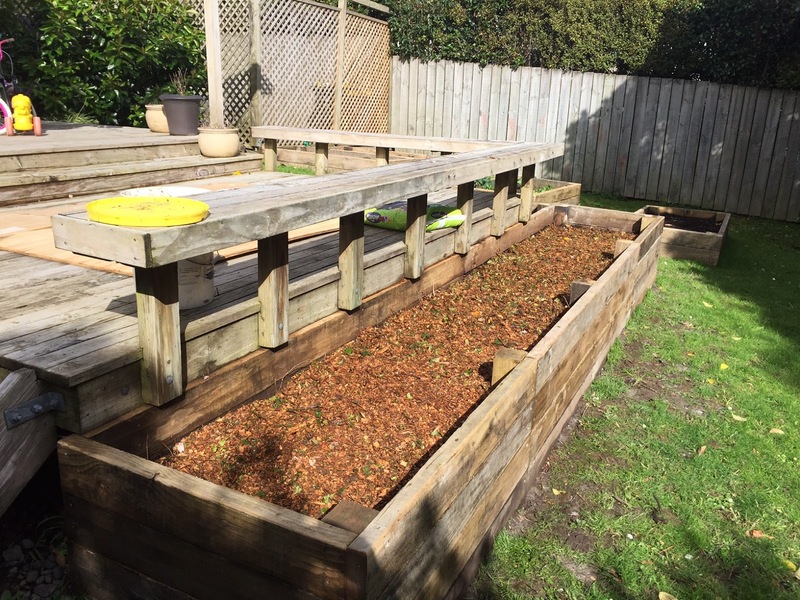 The final raised bed is in the ground. I started filling the bed as soon as it was down, even thought it was raining. 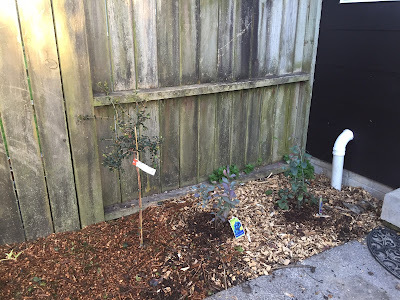 First I sheet mulched it with cardboard and newspaper, then layered on a big pile of cabbage tree leaves from my neighbour. On top of that I alternated layers of wood mulch and used coffee grounds. My garden is pumped up on caffeine. 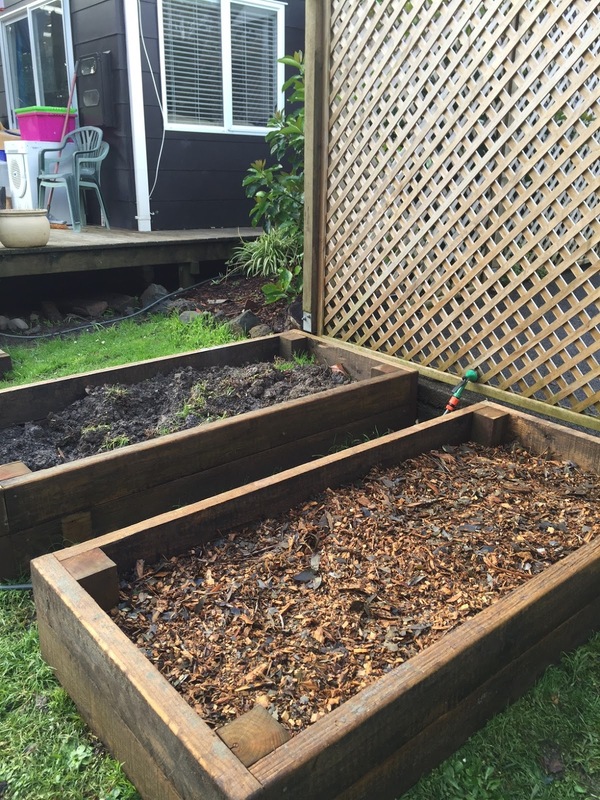 Today I added on a layer of chicken poop and then topped that off with more coffee grounds and wood mulch. 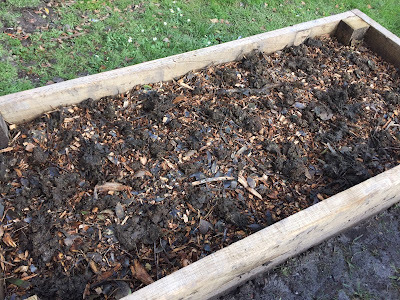 Chicken poop on the fifth raised bed. The weather turned so nice today that I decided to head to the garden store and buy some plants. I've been reading the permaculture book Gaia's Garden this week, and it is getting my imagination firing with ideas for the garden. One of the thoughts I took from the book was that it's good to plant some perennial vegetables, since you only have to plant them once and then they will keep coming back year after year. This saves energy and resources. With that in mind, I bought some asparagus crowns today and planted them in one half of our bottom raised bed, which is already half planted out with garlic. 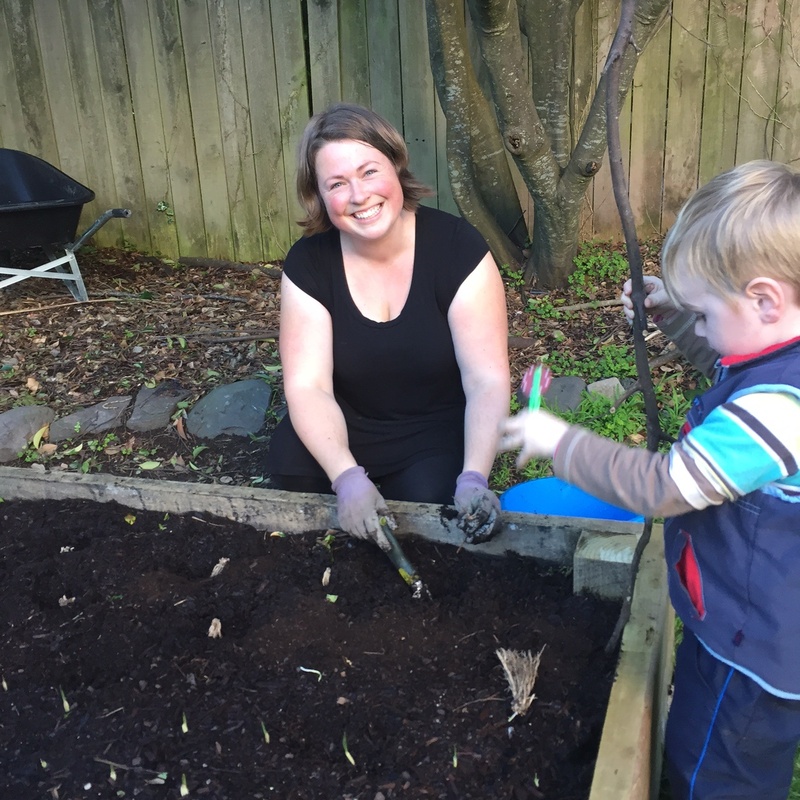 S took this photo of me planting asparagus crowns behind our garlic crop. Here's one of the asparagus crowns going into the ground. My gardening gloves are looking a little worse for the wear after the past few months of intensive gardening. Now look at these cute garlic shoots. 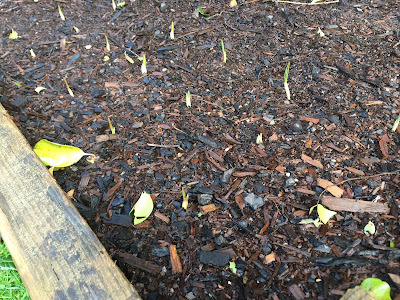 I've never grown garlic before, and I just planted bulbs from the vegetable store so I wasn't sure whether they would survive, but I saw them poking their little heads above the soil this morning, so that gave me a smile. 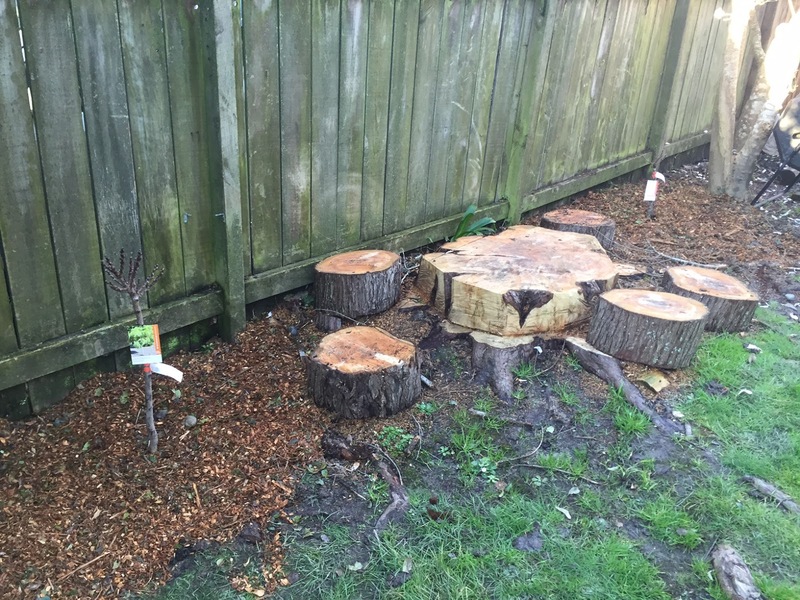 Today at the garden store I bought two dwarf nectarine trees, which I planted on either side of our fairy table. I'm picturing my kids sitting on their little logs, picking nectarines and eating them right there at the table. Beautiful. Next to the fairy table is this big beautiful blossom tree. 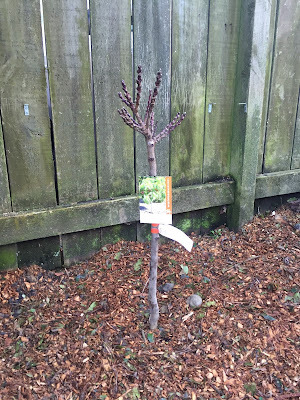 When the nectarines start flowering, it's going to be a riot of blossoms out here. 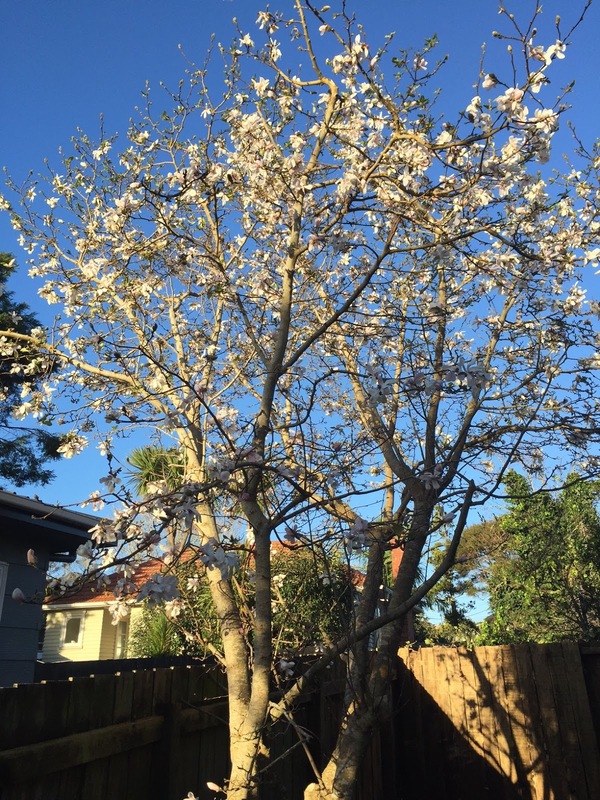 Our blossom tree in full bloom. I got two different varieties of nectarines - Nectar Babe and Garden Delight - to let them cross pollinate with each other. Nectarines are a favourite of mine (and everyone else in our family), so I'm excited to have these trees in our yard. 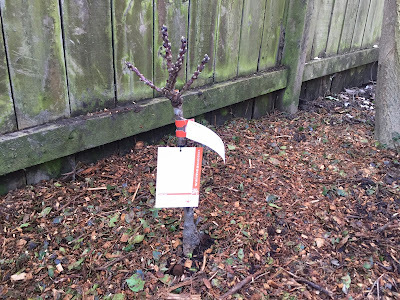 Dwarf nectarine - Garden Delight. 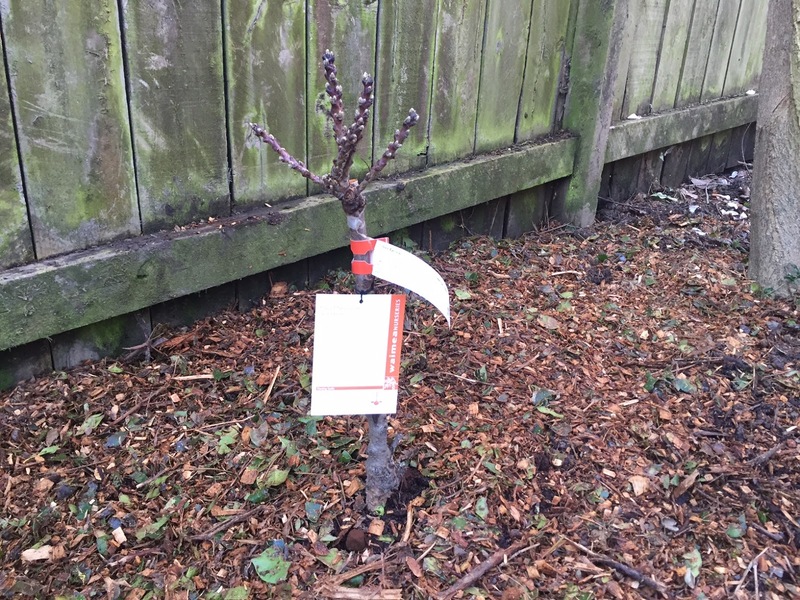 Dwarf nectarine - Nectar Babe. 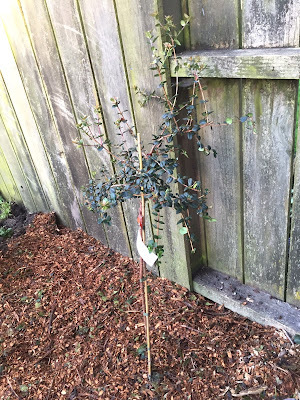 The other fruit tree I got today was a cranberry, which I planted next to our blueberries. Cranberry tree next to two blueberries. I want to plant more in this space, and am hoping to source a grape vine to grow on the fence behind the blueberries and cranberry. In the foreground I'm thinking I will plant strawberries as they are low to the ground and won't shade out the plants behind them. That way I will be able to grow a range of plants at different heights and maximise this sunny corner. 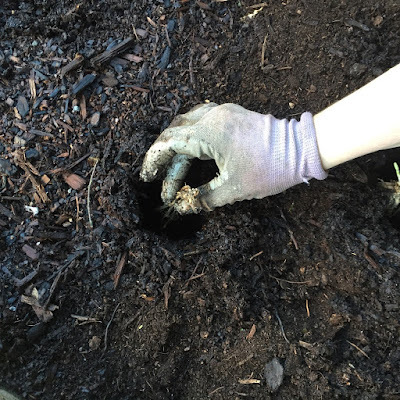 Is it possible to be addicted to gardening? If I am, is that a good thing or a bad thing?